10198 Tantive IV was released in 2009 as part of the Classic Star Wars line. It contains a model of the Tantive IV with five minifigures, including Princess Leia, Captain Antilles, a Rebel Soldier, C-3PO and R2-D2. Although the model was released with minifigures that could be positioned inside, it is not to scale with the figures themselves. 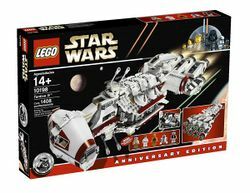 The Tantive IV contains 1408 pieces. It features two removable escape pods, turnable turbolasers and a transport vehicle inside the storage room. The interior comprises a cockpit and a large room in the central section of the ship. The cockpit can be opened, two Minifigures can sit inside. The central section of the cruiser can be accessed by removing the roof and contains reveal several details such as Princess Leia's desk and several control monitors for the crew. The Tantive IV is 52cm long, 19cm wide and 14 high. This set includes Princess Leia, Captain Antilles, Rebel Soldier, R2-D2 and C-3PO. It was officially unveiled at the 2009 San Diego Comic-Con International. The first pictures of this set were discovered in the back of the 10196 Grand Carousel instruction booklet, however more on this set was announced at San Diego Comic-Con International. The Tantive IV also appeared in 10019 Rebel Blockade Runner (as a UCS-scale model) and 10030 Imperial Star Destroyer (as a mini-scale model). This is the first time it has been released in minifigure-scale. The top right and bottom left engines are partly maroon. This set was originally an Exclusive set but is now a Hard to Find set. This is a description taken from LEGO.com. Please do not modify it. (visit this item's product page) The Star Wars™ saga begins! Blasting through space with Darth Vader’s Star Destroyer in pursuit, the Tantive IV blockade runner carries Princess Leia, C-3PO and R2-D2 on a vital mission for the Rebel Alliance. Celebrate the entire Star Wars saga with this all-new version of the very first starship seen in the films! The Tantive IV features an opening cockpit, rotating and elevating turbo laser cannons, rotating radar dish, removable roof section and interior command center. It also includes an opening compartment with removable cargo transport vehicle and 2 detachable escape pods for the droids to make their getaway with the Death Star plans! Includes Princess Leia, C-3PO, R2-D2, Captain Antilles and Rebel Trooper minifigures. Measures 20.5″ (52 cm) x 7.5″ (19 cm) x 5.5″ (14 cm). Includes 5 minifigures: Princess Leia, C-3PO, R2-D2, Captain Antilles and a Rebel Trooper! Open the cockpit and place 2 minifigures inside! Turbo laser cannons on top and bottom can rotate and elevate! Lots of interior details including Leia’s desk and command center with seats for 2 minifigures! Features rotating radar disc and 2 detachable escape pods! Facts about "10198 Tantive IV"
ShopDescription The Star Wars™ saga begins! The Star Wars™ saga begins! This page was last edited on 6 July 2016, at 04:04.